Every class taught by Bruce "Charlie" Johnson includes some type of printed hand out to help reference what you learned during the class. Where practical and appropriate, the classes are taught in a hands-on fashion so you learn by doing. All class exercises are followed by a discussion of what you learned and how to apply that to being an entertainer. These classes are suitable for clown conventions and alley meetings. They are also available as private classes, and Bruce is accomplished at personal coaching of entertainers. Carole Johnson's dream is that there would be a clown at every hospital. 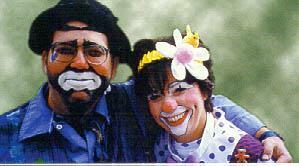 She is a popular Caring Clown instructor, and teaches both group and private classes.